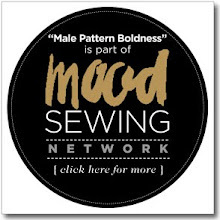 male pattern boldness: My Self-Drafted Men's Shirt + Kenzo Klunker? 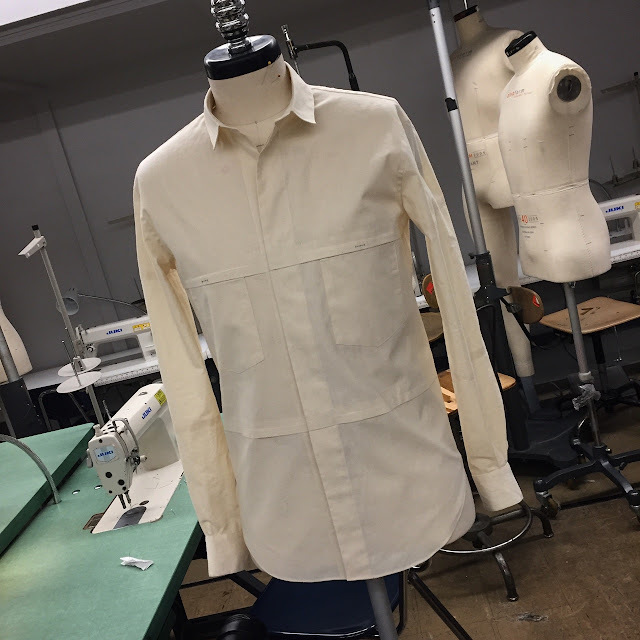 Here's the shirt I designed last week for my menswear patternmaking class at Fashion Institute of Technology (FIT). Anyway, for our assignment, we were asked to draft a shirt pattern with multiple style lines. 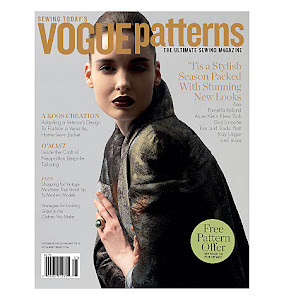 A style line is a seam that contributes to the style of the garment but not necessarily the fit. You might say all fitting seams are style lines (think princess seams) but not all style lines are fitting seams, if that makes sense. 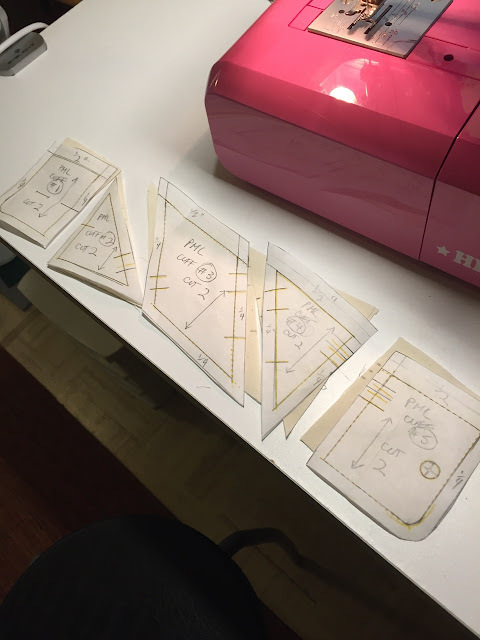 You're basically cutting a pattern into separate pieces, adding seam allowances (and notches), and sewing the pieces back together. Our shirt cuff had to include four style lines (these could be intersecting, curved, straight, etc.) I originally designed a cuff with fancy swirls. When I tried to sew it, however, I quickly realized it would take much more time to assemble than I had available. So I created a more angular design (below) that was easier to sew. 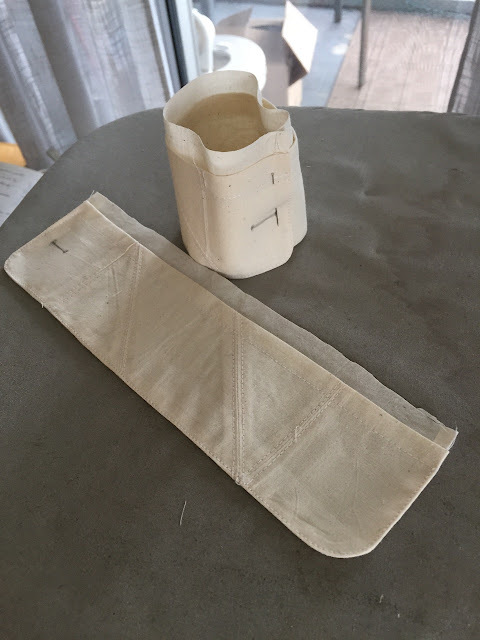 We had to sew the entire garment in muslin, but you can imagine that if I used one or two different contrasting or complementary colors, this cuff would be quite eye-catching. The body of the shirt itself also had to include style lines, and these were to go through the entire shirt -- front, back, and sleeves (This particular shirt does not have a yoke.). Here's my original design. In the end I didn't add bellows breast pockets (which looked too bulky when tested in my muslin so I substituted simpler ones) nor lower front pockets, which seemed to throw off the balance of the shirt. Across the front are two rows of horizontal tucks, 1/2" deep. These form narrow pocket flaps, with a button atop the flap at the center of the pocket. 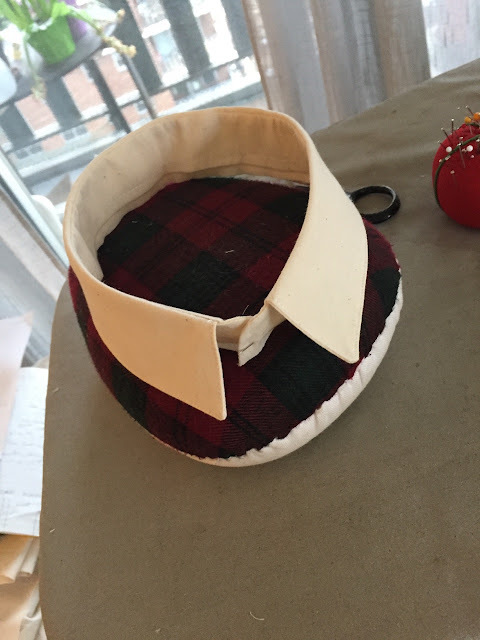 If I were to tweak this design, I'd reshape the collar, which is bit too small, narrow the hidden button placket; and deepen the tucks to maybe 3/4". That's it. In addition to sewing a complete shirt, we had to hand in the pattern. 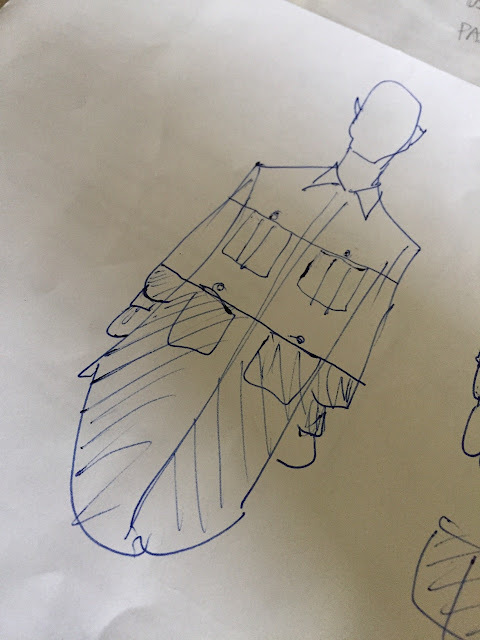 If the shirt front has two horizontal style lines like mine does, that splits the front into three pattern pieces (not including attached plackets). This also applies to the sleeves, back, etc. 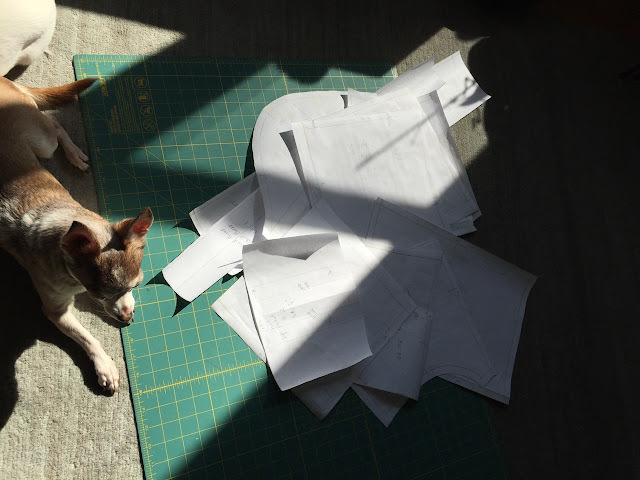 Every pattern pieces must be labelled, notched, include the grainline, garment size, etc. When I was looking for inspiration related to men's shirts and style lines, I stumbled upon this Kenzo shirt from 2013. QUESTION: Does this Kenzo design represent color-blocking gone awry, or do you like the look? Love your version, especially the style line across he chest with the buttons. I agree the Kenzo one looks strange. If the sleeves had been white where he chose black op it might have looked better. I still think I would prefer yours though. So much more classy. Love your style lines but that Kenzo is almost creepy. It almost like looking at a cruel spell a wizard put on an unsuspecting villager by shortening his arms so he could not carry away gold from the king or some such crap like that. Your cuffs could really make an impact done in contrasting colors and fancy topstitching without looking too harlequin. Your shirt is really great. That Kenzo thing is hideous, unflattering, and creepy. Perfect for Halloween maybe. 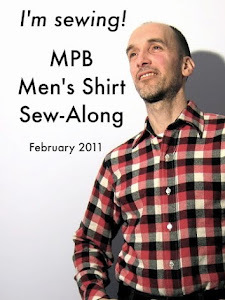 Big props on your self-drafted shirt design. The style lines across the chest anchoring the pockets look great. 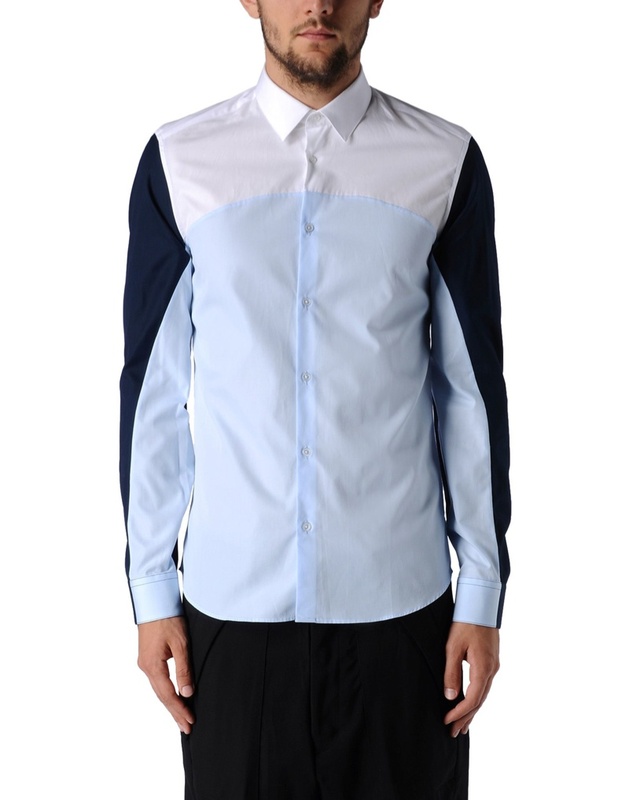 The Kenzo shirt is a total colorblocking fail to me. The Kenzo would look good with some panels using some small floral.....it is too futuristic using block colour. I love your design Peter! That kenzo shirt is terrible. I can't imagine any man who would wear it willingly. The lighter color should have been on the top of the sleeve. That kendo shirt is awful but I love yours! The Kenzo shirt effective if all you want is double-takes on the street. Yours looks like attractive clothing. You get my vote. You shirt is wonderful. The cuff would even be good in all one color with contrasting top stitching. I agree with your proposed tweaks. The Kenzo shirt is just odd. Why are there funny wrinkles at the armscye on both models? Bad design, not made for real people. Your self-drafted shirt is fab! Kenzo shirt is bizarre, weird, and otherwise goofy and unflattering. Your shirt however is simply mahvelous dahling. Perhaps the Kenzo blocking matches perfectly at the underarm point but that is obscured when the arm is in a natural position. What bothers me in the top pic is that the arc doesn't continue smoothly but I imagine in motion that wouldn't be noticeable. Anyway it's clearly intended to be disfiguring (especially shown against a black background) but I'd like to see someone wearing it in person before judging. I think you're right: the match works on paper but sewn up, the blue part of the shirt front and the blue part of the sleeve don't line up at all, creating a jarring visual break (to my eye). I like the Lappin look. I'm with you, sister. The shirt is eye-catching in muslin, and the illustration has a compelling quality. I like your shirt. The kenzo? Not at all. It makes the model's body look strange, like he can't move his arms. Weird. I really like your shirt, but not the Kenzo; it is weird, indeed. Peter, well done on the shirt! It's a great design, where the Kenzo shirt certainly has some weirdness going on! I love your shirt! Every time I scroll down past the Kenzo shirt I expect to see two sets of hands. Very uncomfortable. Yup, looks like someone has cut off his arms and stuck them back on in the wrong place. Looks like a 4 year olds drawing of a person...All out of proportion. Your style lines, however, I love. 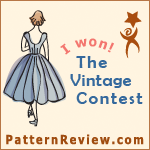 When are you going to release patterns for sale?! I really like your shirt. 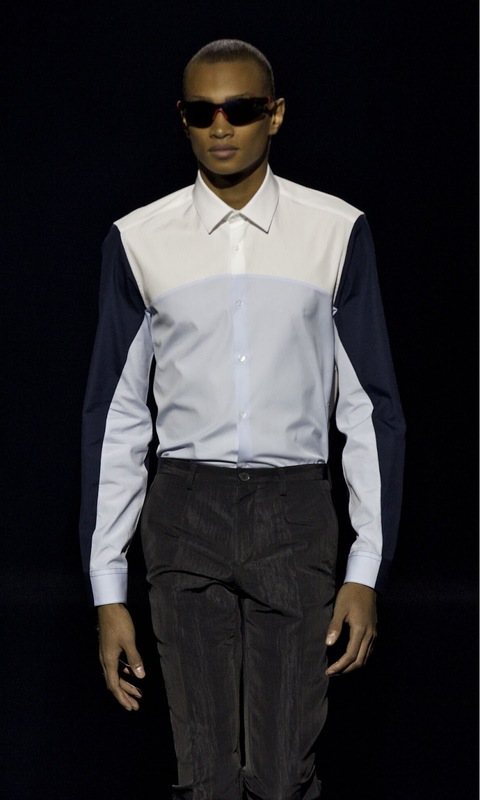 The parallel style lines give the shirt a balance and symmetry that is completely lacking in the Kenzo shirt. The latter would have no doubt finished on all the 70% off, end of season rails that Kenzo could muster. Yours would sell. I also really like your idea for working on the shape and detail of the cuff : it's a shame you were put off by timing; it could add a real air of originality and creativity. And finally, am I the only one who loves your drawing?! I'd frame it and put it on the wall; there's a real freedom in your line which is most aesthetically appealing in my view! A great project and we look forward to seeing the finished thing! Your design has style and class, Peter. It would definitely be a good seller. The Kenzo design just looks weird; couldn't imagine wearing it. Well the kenzo design definitely seems off. Yoursbis a good design, Peter. Color blocking is tricky. I think the Kenzo shirt design is not flattering because it makes you wonder about the shape of the person in it -- a sort of optical illusion. 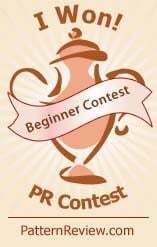 The design would work as a costume if you needed someone to look like a circular object. I am so intrigued by your design. Maybe it is the muslin, but it looks like a high end safari shirt to me (maybe that's my frame of reference talking). I love the way the pockets fit into the tuck. 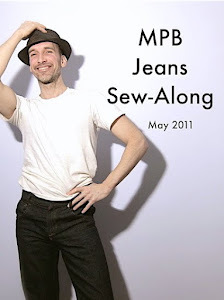 What fabric would you make it in? Would you color block it? Yes, I would color block it, maybe in shades of blue, with the lightest on top. Mercerized cotton perhaps?